Oh, and I think dual-typed Eeveeloutions would be AWESOME! A mmorpg where you can travel through all the reasons and battle real people. Three slots of save game and an ability to trade between the saved game, that's all. what i would like would more variety in game corner, maybe some skill based games? 4) More variety earlier in game - Some of the better type of pokemon don't come until later in the game which is understandable, but I would like to see a better variety earlier in games. 9) Higher Resolution - Since the release of DSi XL I would like to see a game have a higher resolution yet maintaining the standard "feel"
I could rant and rant, but I assume this is pretty much the most of it. You can nit pick at anything, but all in all pokemon has always been a really sound game. I'm with Zero Cool on a lot of his ideas. And I also saw someone say that they wanted to have their own music able to be uploaded in the game. That sounds to me like an Xbox or PSP idea to me, but I do like the idea of fighting the Elite Four and listening to "The Final Countdown" Cliche? Hell yes, but I don't care. Also, there's only one thing that's bothered me year after year of playing the games. In the anime, Ash gets a Pikachu as a starter, an electric type, in the manga, Red has a Poliwhirl, a water type that evolves into a water-fighting type. So instead of the classic Fire, Grass, and Water starters, I would like to see some kind of type change-up for starters. Maybe even more starters to choose from too. Like maybe you decide to pick a psychic type like an Abra, and then your rival picks a dark type like Poochyena or something. Or maybe you chose a fighting type like Machop. And what if we simply want Pikachu back as our starter? That's what I think. And that's what I'd like to see too. I don't know if the next generation of games will have any change in the starters though, that much I doubt. We'll just have to see what they have in store for us after Black/White. I didn't specify this, but the costume, or clothing diversity for your character would be great too. I mean I thought it was great when you got to dress your character up as a member of Team Rocket. That was a cool outfit actually, and like I said, I'm with Zero Cool on just about everything. I mean could you imagine training your way up to Azeala town and maybe once you meet Proton and beat him, instead of running away he offers you a position on Team Rocket? Then yeah, your story changes, maybe you rise to become the top executive of what's left of Team Rocket. Or maybe whoever the good guys are try to get you to work for them as an undercover agent. That would be cool. I would like to have more rivals. Maybe some from previous games like gym leaders from other regions. Also how about six starters maybe fire grass water steel rock and bug? Maybe. That's all I have for now. wow, i never realised that there were so many people who want all the things which i want in a pokemon game to be in an actual game!! multiple save files, all regions, everything ive read(only a few pages) would be amazing if it came true!! Totally trash HMs. Flying pokemon can fly. Water pokemon can swim. Fire/electric pokemon can light caves. Pokemon with claws can cut trees. Period. HMs are a total waste of move slots for things that should just go without saying. A LOT more gameplay with interesting things to do. I don't want to have to grind against level fifties for hours to get a pokemon to level 100. (which I've never done since that's such a waste of time). A special challenge after the elites where there would be a high level (either 70-80ish or scale to your level) trainer of every single type spread across the world to hunt down and fight that you would receive a special reward for defeating the, all.
. . . I think that's all I've got for now. I'm probably forgetting some things. Multiple save files and the ability to trade between them. The ability to customize your character, like the Wii Avatar's. And a ****ing Vs. Seeker. Bring back the PC item storage, PLEASE! I really dont like having to go through a ton of items, EVEN if they are arranged alphabecitaccly and such. There;s just too much items to keep in one bag! i'd be happy if they just brought the pokeball section of the bag back, that alone would help reduce the crap i have to scroll through. I agree though, the PC item storage was really handy for storing all those "boost x type" items that i could never bring myself to toss, even though I never use them. Thats why I am happy with my SoulSilver. I am hoping for a new 3rd Pokemon 5th generation game or at least a remake where you can get those pokemon to follow you. I have a LONG wish=list so I've broken the list down into (A) Things I want to be brought back, (B) Things I want o be eliminated, (C) Things I want to be changed/revised (D) Things I want to be added (E) Things I want to stay the same. 1. Bring back the contests! I loved the Pokemon Contests and Ribbons! Not to mention that we lost a unique evolution method (poor Feebas, now he needs a prism scale). 3. Secret Bases/Underground System should be brought back and COMBINED. That's right. Where Secret Bases connect to your underground hideout. I think that these "bases" should be used for something other than decorative purposes. Like battling or trading or something. This probably sounds stupid to everyone else...but I would like it haha. It also would be a good way to get money, loot, Fossils, Heart Scales, etc. 4. PokeRadar! Am I right? Of course I am...who wouldn't want a way to get shinies/rare Pokemon. 5. PokeTech Watch/Apps NEEDS to be back. That thing was so useful, mainly for DayCare things, like leveling up, hatching eggs, and checking to see if an egg has formed. 6. Gambling The Game Corner is something that I would like back, but really is low priority for me. If they do bring it back, they should add more mini-games. I used to use them to test my luck that day, haha. 7. We need a VS Seeker or other way to re-battle trainers, like one kid said before me. 8. I suppose an Item Storage, although I only used it for things that I thought might be useful later in the game. 9. The ability to create Pokeballs! Except maybe you could do it yourself instead of relying on Kurt and his Apricots. 1. For the love of whatever you believe in, get rid of "shining the badges" mini-thing. I never saw the point, and frankly it's nothing but annoying. 2. The shaking grass/swirling dust/bubbling water. I just don't like them. They should stick with making them rare. 1. A better organizational system for the bag: I liked the one they used in Gen IV. Yes, it was a lot of pockets, but there was so much less scrolling then now. 2. A more engaging plot, please. I realize that Pokemon is made for little kids, but must the plot for every game be so...bland? This go-round was a little better, I will admit, and I (unlike others) actually enjoy how much they entwined it into the game play this time. 3. The HM system needs to be changed! I love the new TM system, but the HM system is as stupid as ever. I don't care what they do, but they really should change it. 4. A more challenging game-play would be nice. Harder trainers, gym leaders, Elite 4, etc. 5. Dream World. I'm not sure what else to say. 6. The fly/location map for should be more sensitive to the D-Pad. Maybe I'm just an idiot, but it's taken me a lot longer to scroll around and fly to places than I feel it should. 1. A Fire starter that ISN'T part fighting. It's a tad old. 2. More unique typed Pokemon! They're so interesting! 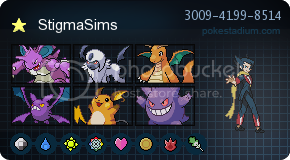 While we're add it, add some Pokemon to types that used to be unique. I think a new Water/Dragon (my favorite types) would be great! 3. Add a few more Eevelutions, just for the heck of it! I don't see why everyone hates them so much...I think they're cute. 4. An easier way to get Heart Scales. 'Nuff said. 5. A way to battle past Gym-Leaders, Elite 4, Rivals, and Champions - for nostalgic purposes of course. 6. Multiple save-files[b] fo' sho'! I never even thought about this! Now, if I let my little cousin play some Pokemon, he won't SCREW UP my game! 8. A sandstorm mode for Castform - it's been bothering me for a while! 1. Please don't change the new TM system! I know that now all the "good TM's" are harder to get, but doesn't that just add to the challenge? 2. Battle Subway is amazing, except for the point system...you battle 7 hard trainers and get 3 points. 3. The side-quests should never be removed. What would Pokemon be without it's Post-Game? If anything, they should add more (FR/LG anyone?). 4. The new multiple registered items choice thing, or whatever you call it, is actually something I would have never thought of. It's a good move though, and I'm really enjoying how you can register certain non-key item things, like Pokemon Stats and stuff. 5. The WiFi Events. It's probably the smartest thing they've done. Just sayin'. I would like to see more use of a PokeWalker style add-on to the games.I enjoyed walking around with my pokemon leveling them while catching other pokemon.If they brought that into Black or White version as I had hoped for them to do , I would be playing it more lol but hopefully when they decide to make new pokemon games , they'll use that concept again and revamp it as a better training tool to use.Also , I don't think it should cost watts to find the pokemon in the grass , there should be a different system of finding pokemon and unlocking new places because I grew too tired of having to decide what to use my watts on. ooh good lord if i had a scanner i would show you but i dont so i will just say... i created my own pokedex. all originals and no repeats. 120 somthin and im working on a new page cause 120 is bland. 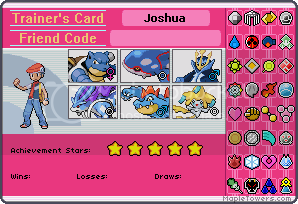 and by pokedex i mean just the images... still has to make move sets. In all othyer pokemon games, when Aerodactyl uses bite, a random pair of teeth apears and closes. Kaboom, youve done damage and all youve done is stand there. I want the pokemon to actuly go up to the enemies and bite them. That will make it a lot more realistic. Also want more types like virus, light etc.